Join archaeologist Aliya Elasra and her robot sidekick Six to investigate the Nebula, an ancient network of scattered moons. Discover lost sites, freely explore ancient ruins, and translate the inscriptions you find to unlock the secrets of the Nebula's forgotten past. In this open world adventure you will decipher an entire hieroglyphic language to solve a massive interlocking puzzle with a unique narrative twist: the translations you choose feed back into story, changing Aliya's ideas about what she's uncovered. But be warned -- you'll never know for sure if your guesses are correct. This non-linear game allows you to approach the story in any order, with every choice you make and every path you follow (or don't follow) feeding into what happens next. A diverse cast of characters -- some kind, some cautious, and some out to con you -- will react to everything you say and change their approach depending on how you treat them. 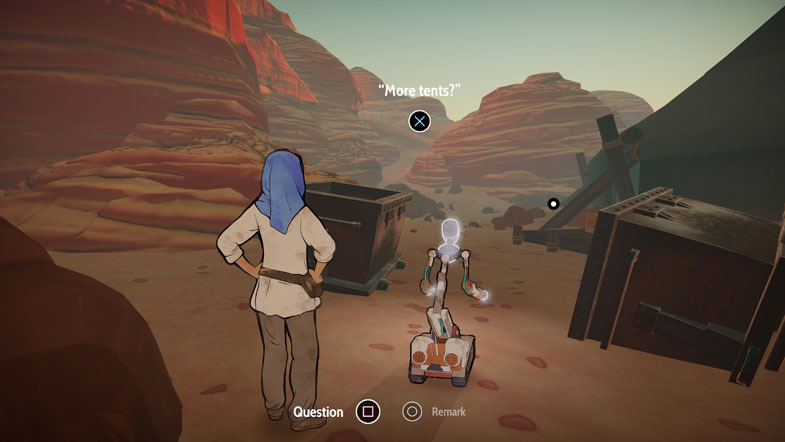 Heaven's Vault's branching storyline is powered by inkle's robust ink narrative engine, which has been adopted by a growing number of developers for games including The Last Night, Where the Water Tastes Like Wine, Dream Daddy, and Bury Me, My Love. Hands-on press demos: The developers will show Heaven's Vault behind closed doors at the Game Developer's Conference in San Francisco, March 19-23. If you're a journalist attending the show and want a sneak peek, please write back to inquire. Public demos: Heaven's Vault will be playable on the show floor at PAX East in Boston (April 5-8) and EGX Rezzed in London (April 13-15).